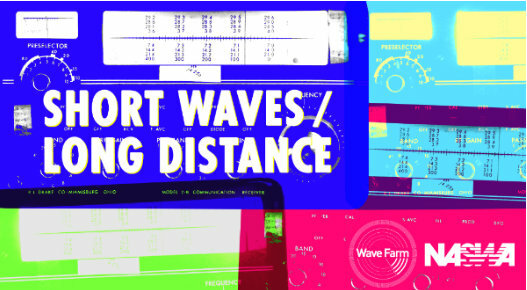 Wave Farm and The North American Shortwave Association are pleased to announce “Short Waves / Long Distance,” an open call for works exploring the sonics of the shortwave radio spectrum (2-30 mHz), and the experience of long-distance listening. The call is in conjunction with the 30th Anniversary of the Winter Shortwave Listener’s Fest and Wave Farm’s 20th Anniversary, both of which will be celebrated in 2017. Featured as part of a one-hour program during David Goren‘s Shortwave Shindig held at the Fest on Friday evening March 3, 2017, and broadcast worldwide on shortwave via WRMI(Radio Miami International) and Wave Farm’s WGXC 90.7-FM in the Upper Hudson Valley, New York. Included in a special program to be produced for the Ràdio WEB MACBA series INTERRUPTIONS. Archived online at wavefarm.org, and shortwaveology.net. • Submissions are welcomed from all genres. • Both pre-existing and newly created works are eligible. • Works should not exceed ten minutes in duration. • Artists seeking additional ways to record shortwave sounds are encouraged to contact David Goren for guidance at shortwaveology@mac.com. • A jury comprised of The Shortwave Shindig’s David Goren, and Wave Farm’s Galen Joseph-Hunter and Jess Puglisi will review submissions. • Selections will be announced in February 2017. This entry was posted in Art, News, Shortwave Radio and tagged David Goren, NASWA, Wave Farm on December 4, 2016 by Thomas.